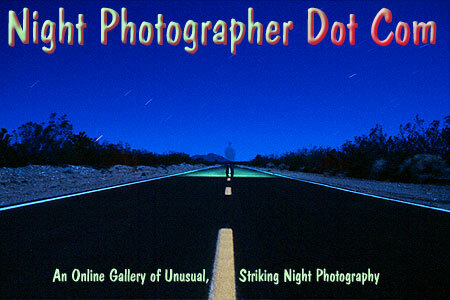 Welcome to www.nightphotographer.com, an online gallery of unusual, striking night photography. Since so many interesting details seem to get lost in the shadows after dark, I sometimes use special lighting effects in my night photography. These colorful highlights are created by adding colored light to the scene, on location during the time exposures. None of these lighting effects have been created digitally or in the darkroom. To see the photos, click "Photos" and choose a gallery from the pictures that appear. The 2006 Update is nearly complete and will be online within the next two weeks with some amazing new night photography! If you're not already on my mailing list, click the Updates link on the left and sign up so I can let you know the moment the new images go online. This update will be well worth the wait! Over the past year, the Starving Artist Van has taken me on some great road trips. I discovered a number of ghost towns, the scene of a spectacular landslide that consumed a road, the ruins of an early 20th century industrial location reminiscent of Stonehenge, a remote semi-desert region that could easily pass for an alien landscape, and my first abandoned drive-in theater! The road trips and the experiences along the way were a fun ride, and I hope you enjoy the photos. To accommodate all the new images, there are currently Two New Work Galleries. To see the photos and read stories about shooting them, click "Photos" on the left, then click on one of the top two galleries that appear. Hey! There's people in these photos! Yup. 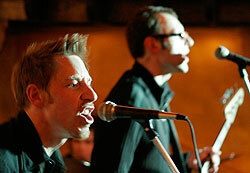 I recently landed a gig shooting for up-and-coming rockers Screwtape Lewis. It's an exciting time for this high energy four piece band. Their first radio single is going national and they've just been cast in a movie! This is a bit of a departure for a solitary night shooter but it's the most fun I've ever had on an assignment job! Click Here for the full story. 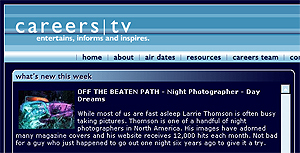 A recent episode of Careers TV featured a story about Night Photographer dot Com, and about making a go of it as a night photographer. Check out the Careers TV Web site for all the details. 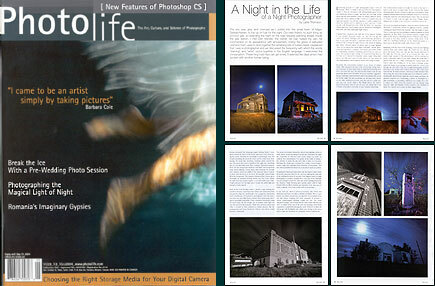 Check out my article on night photography in the January 2005 edition of Photo Life Magazine. If you would like to order a back issue, visit Photo Life's web site. 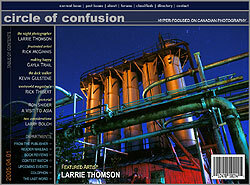 My night photography is featured in the current issue of Circle of Confusion, a great new Canadian Web magazine all about photographs and the people who make them. This is the first issue of CoC and if it's any indication, this is going to be an outstanding e-zine. Loads of quality articles, reviews, forums, classifieds and more make this a site to watch. With some magazines about photography getting heavier on ads and lighter on content, it's refreshing to see a site like this come along. Check it out! One of my night photographs appeared as the Roadside feature in the April 2004 issue of Westworld Magazine, Alberta Edition. This is a travel and motoring magazine published five times a year for the Alberta Motor Association. If you are a CAA member living in Alberta, Canada, you probably already have it. Check the coffee table. Yeah, there it is! Now, look inside the back cover. See? If not, you can see what the magazine is all about here on the publisher's web site. The May 2004 issue of Photo Life Magazine followed me on a night photography road trip. I was recently chosen as Artist of the Week by Beirut based online magazine TheLebanon. 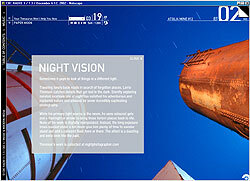 Check out the article on how and why I do night photography, then tour the site. There's something for everybody here in a clever, unusual website full of information, opinions and fun stuff, all with a creative, artistic flavor. Stop by and soak up some of the local culture! CBC, Canada's national public broadcaster recently featured my images on their CBC Radio 3 web site. Presented in an innovative online-magazine format, this new media offering pushes the limits of bandwidth and technology in a merging of great broadcast and web-based content. Just forget it's a web site and treat it like a magazine. That makes it easier to find your way around. It's the magazine with a built-in radio! Cool. The pictures (13 in all) are in amongst the articles. You can go to them directly via the Table of Contents or flip through the magazine page by page. This is a chance to see these images full screen -- something I don't do here on this site. 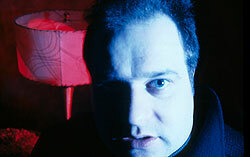 The photos, featured in the December 6-12, 2002 issue, are archived on the CBC Radio 3 site at the links above. I am pleased to announce that one of my images appears as the cover for a recent issue of Crimewave. Crimewave is a crime fiction magazine unlike anything I've ever read before. Full of fresh, cleverly crafted short stories and novellas by a host of talented writers, this is the kind of book you're bound to take off into a corner and read cover to cover. That's what I did anyway. Fed up with what's on the tube? Why not try something different? For the price of a month's cable TV you can subscribe to Crimewave. To learn more, visit the TTA Press web site. To have a better look at the Crimewave 5 cover, Click Here. Night Photography - On Morning TV! : A couple of years ago I appeared as a guest on The Big Breakfast, the A-Channel Edmonton (now City TV) morning show, to demonstrate the night photography techniques used here on the site. We had a blast painting with light, doing time-exposed portraiture and other photographic foolishness in a darkened studio while an infrared night vision camera broadcast the fun on live TV. Click Here to see Big Breakfast host Steve Antle as you've never seen him before! Be sure to check out the Slide Show. The show is a high resolution streaming video that you can view full screen, with a sampling of night images from the site. Because of the high picture and sound quality, this one is strictly for the high speed Cable / DSL / Corporate Lan set though. If you have lots of CPU and a blazing fast connection, check it out. This is somewhat of a departure for me and a bit of an experiment so please feel free to offer your thoughts on the project. Wondering what these photographs look like in real life? Some of my prints are currently on display at The Stopover Cafe, #7, 509-11th Avenue in Nisku. If you happen to be in the vicinity of Edmonton, Alberta, Canada, stop in for a bite to eat, and check out some unique night photography! For hours of operation, directions or more information, call The Stopover Cafe at (780) 955-8845. To see the photos, click here and choose a gallery from the pictures that appear. Wondering what sort of insomniac freak would do this? Click here to find out about me. If you see one you really like, click here to find out more about getting a print of your own. Visit the Links page by clicking here to check out other Photography related sites. Download free wallpaper and vote for you favorite photo by clicking here. I can notify you by email when I post new photos. Click here to find out more. This page lists the web rings the site belongs to. This is a good place to surf for similar sites. Click here. Here's a tip for best viewing: The background of this page is dark green. If it appears black on your computer, turn up your monitor brightness until you see it as a dark, forest green. Now you are set to best view the photos. Enjoy! The photo galleries of this site now carry the FoundView Checkmark, certifying that what you see in these galleries was actually recorded by the camera while the shutter was open, not added later. To find out more, click the "What" link on the left. If you would like a print of one of these images please stop by the purchase page. Check out the Get One link to the left and read all about it. If you wish to inquire about commercial / publishing usage, just drop me a message with details of your project. Thanks for stopping by! Check back often, as this site is regularly updated with new material. I'm always very interested in what you think so please feel free to drop me an e-mail with any comments, suggestions, questions, or what have you. You can use the "Contact" link on the left or e-mail me at lthomson@nightphotographer.com. All images on this site are Copyright © Larrie Thomson. Unauthorized use is a violation of applicable law.